Hi there, welcome back for another day of JustRite Papercrafts January release. Today's stamp sets are called Loving Sentiments Clear Stamps and the background is called Celtic Lattice Background Stamp. I white embossed my background stamp onto my card stock. Than I also white embossed the flourish stamp onto a white card stock, on the top and bottom portion, so I had enough space to add the sentiment center piece. Once I white embossed it I colored it in with ink so the flourish would resist and show up on the white card stock. For the center I used Spellbinders Labels Forty One Decorative Elements dies and also the Spellbinders Tranquil Moments. Here is what the Loving Sentiments Clear Stamp set looks like. 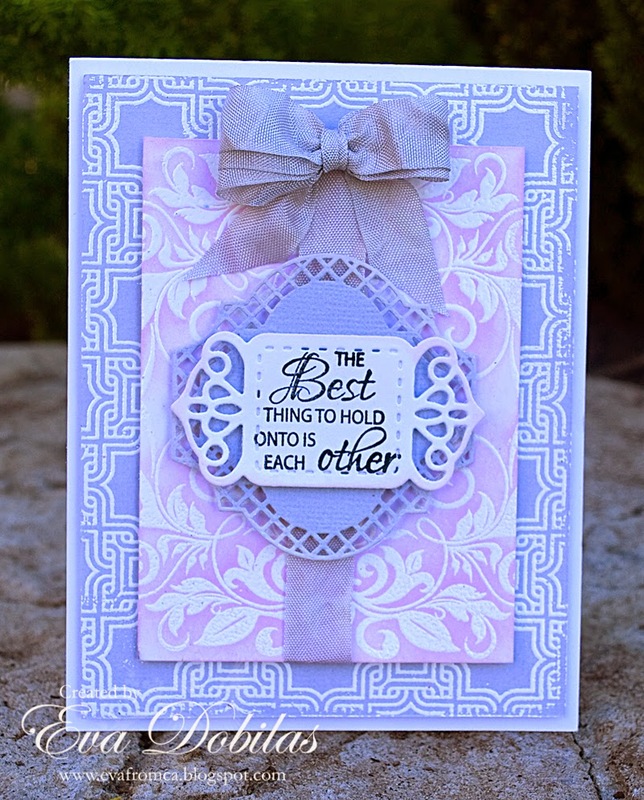 And here is how the Celtic Lattice Background Stamp looks like. Thanks for stopping by and see you tomorrow. Have a beautiful day!